Tony Awards: Third’s time the charm? The 69th Annual Tony Awards are taking place tonight. 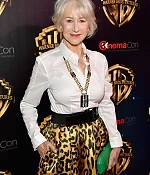 Helen Mirren is nominated as Best Actress in a Play for “The Audience”, and many outlets are predicting her to win. 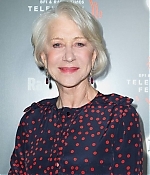 As Vulture writes, “Who will deny the Queen of England a Tony Award to go with her Oscar?” A Tony win would mean a triple crown for Mirren, joining the ranks of actors who have won an Oscar, a Tony and an Emmy. In anticipation of tonight’s ceremony, clips of Helen’s previous Tony appearances – including nominations for 1995’s A Month in the Country and for 2001’s Dance of Death – have been added to the video archive. Look at the coincidence at the 2002 awards ceremony with the award being presented by Helen’s former partner, Liam Neeson and his wife, the late Natasha Richardson, who also happened to be Helen’s co-star in “The Comfort of Strangers”. Helen has had a busy schedule earlier this week when the public promotion for “Woman in Gold” was packed into two days. She has attended The Tonight Show with Jimmy Fallon, Live with Michael & Kelly and The Today Show (twice). Additionally, interview clips from Entertainment Tonight and BBC Talking Movies have been added to the video archive alongside a promotional interview and new clip from the film. Enjoy! Helen’s new film “Woman in Gold” releases in US theaters on April 03, so it’s about time to add production stills and videos from the current promotion for the film. Promotionals, on-set pictures and screencaptures from the making of and trailer have been added to the photo gallery. Various trailer, tv spots and clips have been added to the video archive. Also added is an excerpt of Helen’s most recent appearance on The Charlie Rose Show to promote the Broadway opening of “The Audience”. For “Woman in Gold”, Helen will be attending The Tonight Show with Jimmy Fallon on March 30 and Live with Kelly & Michael on March 31. The New York premiere will be held on March 30 as well, so check back next week for more pictures. On Sunday, CBS’ Sunday Morning ran a profile on Helen Mirren and the Broadway opening of “The Audience”. The programme featured a couple of scenes from the West End run of the play and included an interview with Helen, on the play, Shakespeare, and – inevitably – the old Parkinson interview. The full segment can be watched in the video archive, screencaptures have been added to the photo gallery.